1. SDHC card is EXCLUDED in the package and you need to purchase it separately. 2. Tripod is EXCLUDED in the package and you need to purchase it separately. 3. Shotgun or wireless microphones are EXCLUDED in the package and you need to purchase them separately. 4. This camera is designed for general daily recording or indoor and outdoor entertainment and not for special professional video audio recording. 5.When you used this cmacorder be a webcam, there is not support zooming, please kindly notice that. 6.We suggest kindly format the SD card in the camcorder before use. 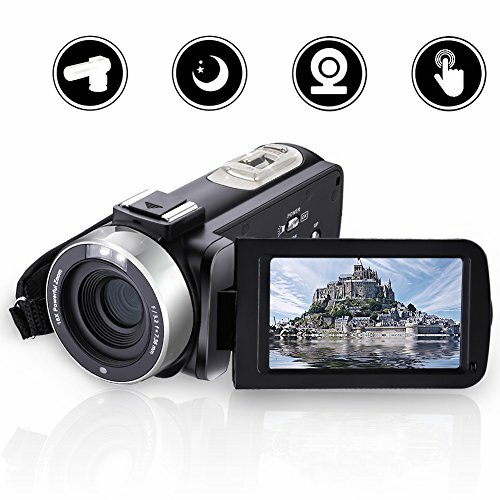 Full HD camcorder: This Full HD 1080p video camcorder comes with 24.0MP picture resolution. You can get decent 1080p video quality and It can used as a webcam for recording live streams, video chats when you use skype, facebook, and so on. It is equipped with IR LED light for night vision shots whose working distance is within 3 meters/10FT. Also, you can capture photos and videos in black and white while in low light situations. It's easy to use and operate with its 3" touchscreen. Support External Hot shoes & Microphone: There are multiple microphones and electronic musical instruments that can work with it. This video camera is equipped with it, and it can connect with external microphone for better audio recording. For MIC, it can support shotgun, wireless and wired. It has standard 3.5mm MIC jack and hot shoe mount. For electronic musical instruments, you can connect it with guitar, electronic piano and so on. You will need a 6.35mm to 3.5mm adapter for the connection. Pause function: The digital camera supports pause function. While recording a Video, You can pause the video recording and continue recording whenever you want. It will record as a single video file, rather than two separate video files. It also supports doing some recording while it's in charging status, also you can charge it and use it without the battery installed, which helps for occasions like birthday parties, trips, life events, and etc. Webcam (PC Cam) function: This camcorder can work as HD Webcam. When you connect it to your PC, you can select "PC Cam" mode, so that your PC will automatically install the driver in few minutes, you can use it as PC Webcam and record live stream for Youtube or vlogging. This video recorder has 3 inch touch screen and it swivels at 270 degree to be positioned at any angles which is best to frame the video scene you want. you can adjust the angle of shooting for selfie or other scenes freely. 12-Months Warranty: One year warranty is provided by COMI. This camcorder uses a memory card(not included) so that you can easily download the videos on your computer by USB cable, and it is super easy to transfer. If your TV have HDMI, you can hook it up to your HDMI TV monitor and see the camcorder's screen while filming. It can also use an universal tripod(not included) to hold this camera and it's convenient to control it by the remote. If you have any questions about this product by COMI, contact us by completing and submitting the form below. If you are looking for a specif part number, please include it with your message.